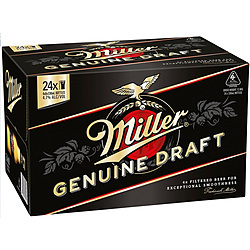 Miller Genuine Draught was introduced in 1986 as the original cold filtered packaged draught beer, which means that the beer is not heat pasteurised. Miller uses an exclusive cold-filtered process this prevents some of the beer's flavour from being heated away. MGD received the gold medal in the American-Style premium lager catagory at the 1999 World Beer Cup. It also received the silver medal the the 2003 Americal Beer Festival.